This PMR report on the global orange essential oil market determines the market opportunities, and provides insights and updates relating to various operating segments of the global orange essential oil market over the forecast period 2018–2027. The report also provides historical data of 2013, along with the estimated data for 2018, and forecast data up to 2027 in terms of value (US$ Mn) and volume (MT). In terms of value, the orange essential oil market is expected to increase at a CAGR of 5.8% during the forecast period. The current study reveals the orange essential oil market trends and market dynamics in five major regions - North America, Europe, Japan, Latin America, Asia Pacific except Japan, and the Middle East and Africa. The report also comprises the study of current issues with consumers and opportunities for the orange essential oil market. The report explores the global orange essential oil market for the period 2018–2027. The overriding goal of this report is to provide insights into the developments in the global orange essential oil market, which are progressively helping transform worldwide businesses that are associated with the same. It is essential to consider that, in the wavering economy, we provide the estimated (Y-o-Y) year-on-year growth rate along with the Compound Annual Growth Rate (CAGR) for the overall forecast, to better understand the analysis and evaluation of the global orange essential oil market, and to discover equitable opportunities. Yet another key feature of this report is the analysis of the global orange essential oil market, and the corresponding revenue forecast is also carried out in terms of absolute dollar opportunity. This is often neglected during the forecast of the overall market. Absolute dollar opportunity analysis is highly essential in determining the degree of opportunity that a provider can observe to execute, as well as to distinguish the potential resources from a sales perspective in the global orange essential oil market. The global orange essential oil market report starts with an executive summary, and the definition of various segmentations that are involved and their respective shares in the global orange essential oil market. The report also encompasses the major macroeconomic factors with an outlook of orange essential oil in the global essential oil market. The report further emphasizes the various market dynamics which cover the major driving factors, current trends, future opportunities, and hindering restraints of the global orange essential oil market. The report also highlights the study of current issues with orange processing, and future opportunities for the orange essential oil market. It also contains value chain analysis that provides a well-defined systemic view of profitability from the product manufacturer to the end user. In order to provide users with a comprehensive view of the global orange essential oil market, we have included the competitive analysis of key market participants and their strategic developments. The competitive dashboard provides a detailed comparison of orange essential oil manufacturers on valuable parameters such as total revenue generated, key strategies, key product offerings, and key developments. The study highlights the global orange essential oil market attractiveness analysis by nature, end user, distribution channel, and region. To evaluate the overall market size of orange essential oil, the report considers various functional aspects based on secondary research. 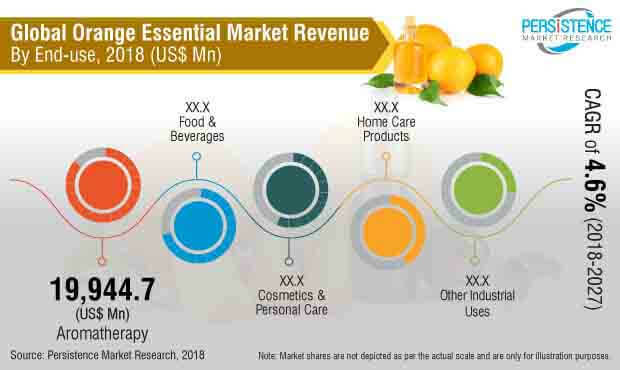 Furthermore, it emphasizes quantitative analysis such as market share by region, and market share by nature, end user, distribution channel, and other qualitative inputs from primary respondents, which have been studied thoroughly to arrive at accurate market results of the orange essential oil market. The forecast provided in the orange essential oil market report arrives at the total revenue which is being generated, and contribution of expected revenue in the future by the global orange essential oil market. Detailed profiles of global orange essential oil manufacturing companies are also provided in the report to assess their differentiating strategies, product offerings, and recent developments, as they have a remarkable effect in the global orange essential oil market. Major market players covered in the orange essential oil market report include Young Living Essential Oils, Doterra International, LLC, Ultra International B.V., Lemon Concentrate, Spark Naturals, Australian Botanical Products, Melaleuca Inc., Kama Ayurveda, Falcon, Moksha Lifestyle Products, Florihana, Plant Therapy Essential Oils, and others. Orange essential oil is an aromatic extract obtained from the peel of the orange fruit. The peel obtained after production of orange juice is used to produce orange essential oil by the cold pressing technique. Orange essential oil is used in food and beverage industries to add a natural orange flavor to beverages, sweets, desserts, and various bakery and confectionary items. The cosmetics industry utilizes orange essential oil on a large scale in soaps, body lotions, anti-aging, and anti-wrinkle products, and various creams. There has been an increase in use of orange essential oil in aromatherapy for its calming and antidepressant properties. Orange essential oil is also used in home and personal care products like room fresheners, deodorants, and sprays. The use of orange essential is expected to grow in the cosmetics and aromatherapy sectors during the forecast period. The demand for orange essential oil is expected to increase in Asia Pacific and Europe at the CAGR of 6.0% and 5.0%, respectively, during the forecast period. The rising demand for products with natural ingredients as well as increasing use of natural home care and cosmetics by consumers with changing lifestyles and increased per capita income is driving the growth of the orange essential oil market in Europe and the Asia Pacific. Increased awareness among consumers about rising health issues due to the use of products with added chemicals and flavors is driving consumer attention towards natural products. Orange essential oil is a natural ingredient that is used to provide exotic flavor and aroma to various food, cosmetic, and home care products. The 'move to organic and natural formulations' trend is increasing, and is expected to grow in the coming years too. Thus, the demand for products with natural ingredients, such as orange essential oil is expected to increase during the forecast period. Orange essential oil is used in food and beverages in order to incorporate a fruity flavor to various food products like beverages, bakery products, confectionaries, and carbonated beverages as well. The increasing popularity of orange essential oil in food and beverages is not only for its flavor but also for its functional properties. The rising demand for fortified and value-added food is boosting the utilization of orange essential oil in food and beverage industries for its flavor as well as nutritive values like vitamin C, which is expected to fuel the demand for orange essential oil during the forecast period. Among the nature segments of the orange essential oil market, the organic orange essential oil segment is expected to register the highest growth rate of around 6.1%, owing to increased consumer preference for chemical-free natural ingredients. However, the conventional orange essential oil segment had the highest market share in the year 2017, owing to its lesser cost and accessibility. Aromatherapy is the use of the aromas of various ingredients for the treatment of different physical as well as emotional conditions. The aroma of natural and therapeutic oils is considered to have various benefits on mental as well as physical health. Orange essential oil is used in aromatherapy in various ways like inhalation, perfume, bathing, massages, etc. There is the growing demand for orange essential oil as a result of the increasing tendency of consumers to seek natural alternatives for synthetic allopathic treatments. The growing interest of consumers towards aromatherapy is an important driver for the orange essential oil market. Poultry and swine feed are often added with excessive chemical antibiotics in order to reduce the growing disease that hinders the production. The growing concern about the ill-effects of the overuse of chemical antibiotics in animal feed has given rise to a new approach of using a natural bioactive compound like orange essential oil. Thus, orange essential oil is as an alternative of chemical antibiotics in the region of Japan, which has attracted researchers and manufacturers, thereby opening new opportunities for the orange essential oil market in feed industries. Due to all these factors, it is anticipated that the global orange essential oil market will increase with positive growth in terms of volume and value during the forecast period.